Hot on the heels of adding Nokia's N97 to its video showcase of phones that show signal attenuation when held, Apple has added Verizon's new flagship, the Motorola Droid X. As with the other phones appearing on the company's Smartphone Antenna Performance page, including RIM's BlackBerry Bold 9700, HTC's Android Droid Eris, Samsung's Windows Mobile Omnia II, Nokia's N97 and Apple's own iPhone 3GS and iPhone 4, the new Droid X is shown dramatically dropping from several bars to zero when held with a normal grip. Apple's videos present evidence for its claim that the Antennagate campaign being waged against iPhone 4 was overblown and exaggerated. Steve Jobs described iPhone 4's antenna issues as "a challenge for the entire industry," in describing the real engineering challenges related to delivering increasingly better reception, smaller device sizes, and improved battery performance. The rest of the mobile industry, and in particular those companies profiled in the death grip hall of shame Apple published, have shot back with defensive statements that suggested their longer experience in building phones exempted them from any engineering issues related to antenna design. BlackBerry maker RIM issued a statement from its two chief executives Mike Lazaridis and Jim Balsillie which didn't deny that RIM's phones had any problems, but did take umbrage at what they called an "attempt to draw RIM into Apple's self-made debacle." Nokia similarly issued a corporate statement that didn't name Apple, but said "as you would expect from a company focused on people, we prioritize antenna performance over physical design if they are ever in conflict," a not so subtle suggestion that iPhone 4 sacrificed functionality just to look cool. Prior to Apple's official response, Nokia had egged on criticism of iPhone 4 with a corporate blog posting that claimed Nokia phones could be held in any fashion without any negative impact on performance. 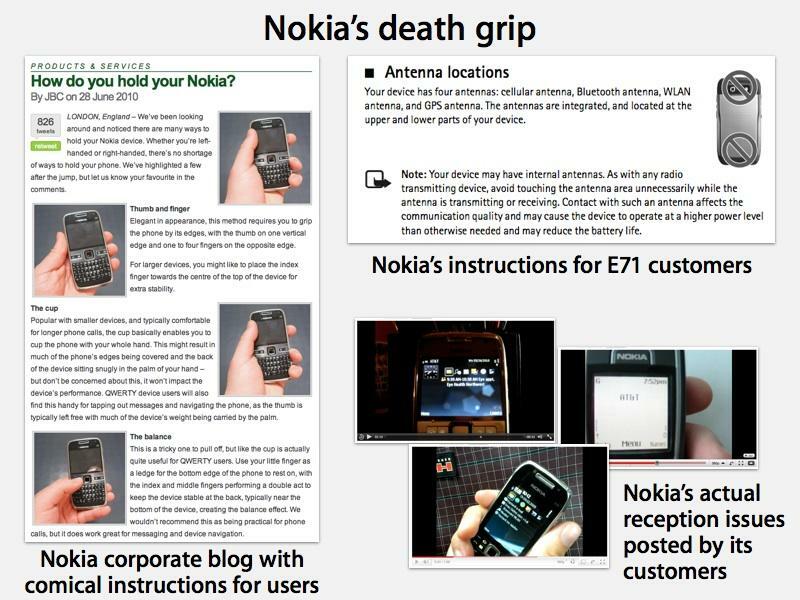 At the same time, Nokia's owners' manuals for its phones include warnings not to hold the phone in a way that touches the antenna when in use, pointing out that this can attenuate the signal and cause the device to work harder, shortening its battery life. Jobs specifically noted in Apple's press conference that you can go on the web and look at pictures of Nokia phones that ship with stickers on the back that say dont touch here." After Nokia's corporate response repeated the idea that as "the pioneer in internal antennas" its products simply couldn't experience any antenna issues, Apple added Nokia's N97 to the videos of phones that can suffer from a dramatic drop in signal bars when held normally. Two other vendors included in Apple's original video comparisons were also quick to issue press releases that suggested they've never heard of signal attenuation issues from their customers. HTC, the company the built the vast majority of Windows Mobile phones and now a primary vendor of Android models, issued remarks similar to RIM, which chided Apple for saying every vendor struggles with antenna design issues. "The reception problems are certainly not common among smartphones," HTC's chief financial officer Hui-Meng Cheng said. "They apparently didn't give operators enough time to test the phone." 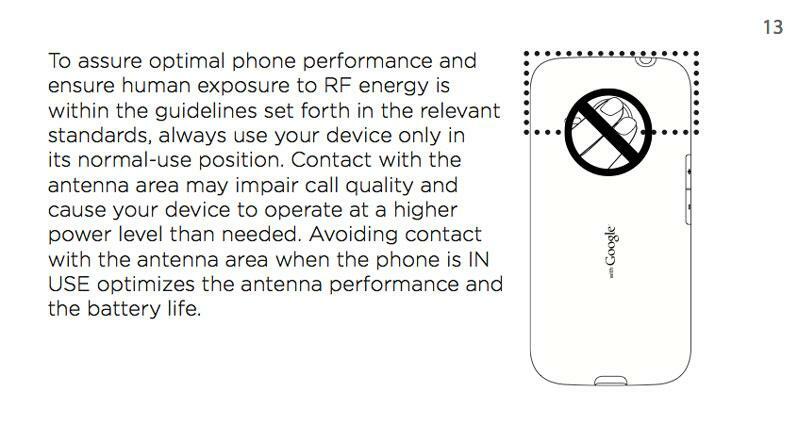 However, like Nokia, HTC warns customers not to touch the antenna while in use as it may "impair call quality and cause your device to operate at a higher power level than needed." Samsung issued a milder response, simply saying it "hasn't received significant customer feedbacks on any signal reduction issue for the Omnia II." The company likely lacks the interest in fomenting crisis for Apple in the way RIM, Nokia and HTC have sought to do because it is a major manufacturer of components for Apple, and makes billions of dollars from iPhone sales. Apple's latest video targets the newest Android phone to be compared against the iPhone, the Droid X, showing that it too can indicate a rapid signal loss when held normally. Its inclusion illustrates Apple's contention that the "death grip" videos that Gizmodo presented as a unique new problem for iPhone 4 are easy to replicate across a wide variety of models from all the major manufacturers, on phones running different operating systems, and using different network technologies. Motorola's co-chief executive Sanjay Jha had previously stated that "consumers don't like being told how to hold the phone" and that "it is disingenuous to suggest that all phones perform equally," noting that his company has avoided placing the antenna on the outside of the phone out of fear that could cause reception problems. Apple's addition of Motorola's latest Droid X to its videos provide evidence that all phones do suffer from some level of attenuation when held, and that this can be dramatically portrayed with signal meter drops, even when the antenna is internal. Apple was criticized by Consumer Reports over the issue, and the magazine withheld its "recommendation" listing for iPhone 4 despite giving it top marks among smartphones. The site has given is "recommended" seal to other phones with the same issues.